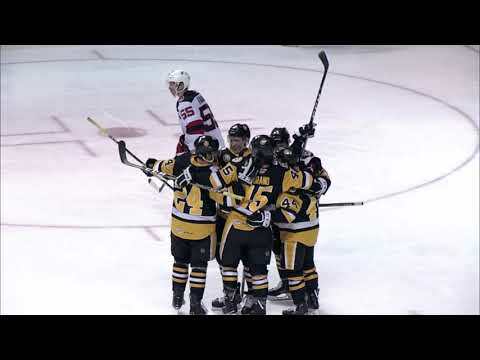 Wilkes-Barre/Scranton scored four times in the first 11:32 of action and added three more the rest of the way en route to a 7-3 road win over division-rival Norfolk on Wednesday at the Scope. The Penguins moved to 4-1-1-0 in their last six outings. Mark Letestu netted a pair of goals and an assist for the Penguins, while five other players added tallies. Dustin Jeffrey got the scoring started with a power play marker 3:55 into the game, and Letestu followed with his first of the night just 38 seconds later. Connor James made it 3-0 at the 8:50 mark, and Letestu’s second of the period came at 11:32 and extended Wilkes-Barre/Scranton’s lead to 4-0. The Penguins’ Paul Bissonnette, Tommy Goebel, and T.J. Kemp each tallied his first goal of the season over the final 40 minutes. Goebel had a goal and an assist on the night, while Janne Pesonen (0-3-3), Ryan Stone (0-2-2), and Adam Henrich (0-2-2) also finished with multiple points. Penguins goaltender Adam Berkhoel earned the win with 19 saves on 22 shots. Justin Keller posted a goal and an assist for the Admirals, while Brandon Segal and Jamie Heward added scores in the loss. Hartford scored once in the second period and once in the third en route to a 2-0 win over visiting Providence. After a scoreless opening stanza, defenseman Jared Nightingale broke the deadlock with his first goal of the season at 7:04 of the second, with Jordan Owens and Vladimir Denisov picking up assists. Greg Moore sealed the Wolf Pack’s victory with an empty-net goal in the closing minute of the game. Hartford goaltender Miika Wiikman picked up the shutout with 15 saves, helping the Wolf Pack collect their first victory in three tries against Providence this season (1-1-1-0). Jesse Boulerice tallied the game-winning goal and added an assist as Lake Erie edged Peoria by a 3-2 final at Quicken Loans Arena. Codey Burki and J.D. Corbin also scored goals for the Monsters in the winning effort, as Lake Erie wrapped up a four-game homestand at 2-1-1-0. Monsters goaltender Jason Bacashihua secured the victory with 20 saves on 22 shots, snapping a personal seven-game losing skid. Jeff Cowan and defenseman Steve Wagner tallied goals for the Rivermen, who will travel to Hamilton on Thursday. Worcester captain Ryan Vesce lit the lamp just 48 seconds into overtime to give the Sharks a 3-2 win over visiting Springfield at the DCU Center. The Sharks took 1-0 and 2-1 leads in the first and third periods, respectively, on goals from T.J. Fox and Jamie McGinn. But the Falcons came back to tie it both times, as Derek Bekar and Guillaume Lefebvre netted third-period markers. Worcester goaltender Taylor Dakers finished with 32 saves in the winning effort, improving his season record to 6-1-0. Rookie forward Nick Spaling netted a pair of goals as Milwaukee took a 5-3 road win over Quad City at the I Wireless Center. Spaling scored unassisted at 12:34 of the first period and then again 1:11 into the second to give the Admirals a 2-0 advantage. Patric Hornqvist, Jed Ortmeyer, and Ryan Jones added goals for Milwaukee, and Andreas Thuresson chipped in a pair of assists. Admirals goaltender Drew MacIntyre earned the win with 25 saves, as Milwaukee finished 4-1-0-0 on a five-game road swing. Jamie Lundmark and Kyle Greentree each posted a goal and an assist for the Flames, and defenseman Gord Baldwin added his first professional goal. Rochester went 3-for-3 on shootout attempts to eke out a 2-1 road win over Houston on Wednesday at the Toyota Center. The Americans’ Janis Sprukts, Jacob Micflikier, and Karl Stewart scored in succession in the shootout. Amerks goaltender Mike Brodeur stopped three of Houston’s four tries. Dan Collins gave Rochester a 1-0 lead at 17:30 of the opening period, but the Aeros’ Maxim Noreau tied it on the power play 8:45 into the middle frame. Krys Kolanos netted the lone shootout goal for Houston, which is now 2-1-0-2 on its seven-game homestand.